The Elk Ridge and Bear Hideaway cabins near Mt. Rainier offer private lodging just minutes from Mount Rainier National Park, Paradise Inn park entrance, or a leisurely drive to Mount St. Helens. Mt. Rainier is the perfect Washington State travel destination for a mountain vacation retreat, holiday, romantic honeymoon, wedding anniversary, birthday gift, engagement proposal, romantic getaway ,or any special celebration. For a nightly, or weekly accommodation, our cabins offer the ideal vacation rentals to be used as your base camp for your adventure vacation, vacation package, extended stay, or romantic weekend getaway. We are centrally located to many attractions. Our vacation cabins can accommodate between 2 and 8 guests, and are ideal for couples, groups, or families with children seeking lodging near Mount Rainier National Park. Whether you're planning a romantic getaway, family vacation, reunion, or retreat, you'll find our Mt. Rainier cabins to be a welcome refuge from the hustle and bustle of daily life. Keywords: Vacation home, vacation cabin, chalet, ski house, skiing, lodge, house, rainier, white pass, elk, bear, hiking, swimming pool, tennis, loft, hide-a-bed, hot tub, spa, rustic, luxury. The Elk Ridge and Bear Hideaway cabins near Mt. Rainier offer private lodging just minutes from Mount Rainier National Park, Paradise Inn park entrance, or a leisurely drive to Mount St. Helens. Mt. Rainier is the perfect Washington State travel destination for a mountain vacation retreat, holiday, romantic honeymoon, wedding anniversary, birthday gift, engagement proposal, romantic getaway ,or any special celebration. For a nightly, or weekly accommodation, our cabins offer the ideal vacation rentals to be used as your base camp for your adventure vacation, vacation package, extended stay, or romantic weekend getaway. We are centrally located to many attractions. 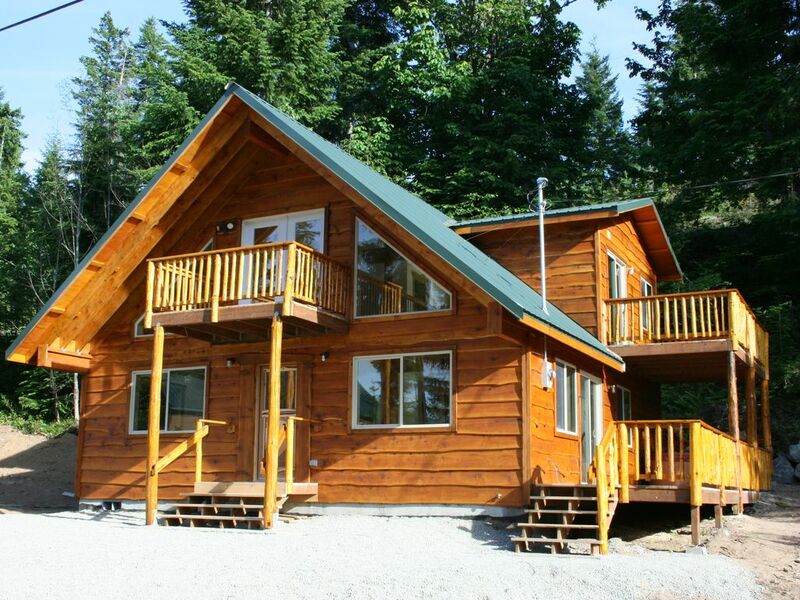 Our vacation cabins can accommodate between 2 and 8 guests, and are ideal for couples, groups, or families with children seeking lodging near Mount Rainier National Park. Whether you're planning a romantic getaway, family vacation, reunion, or retreat, you'll find our Mt. Rainier cabins to be a welcome refuge from the hustle and bustle of daily life. Close to skiing, hiking, mushrooming, wildlife viewing, rafting, biking, and much more! Just 13 miles from White Pass/Mt. Rainer Just 3 miles from the entrance of Mt. Rainer National Forrest. We are not responsible for power outages, satellite outages, or phone or long distance calling outages. You will not be reimbursed for any part of your rental cost if any of these events occur. We loved the location to White Pass for skiing! The beds and linens were comfy. The hide-a-bed is only useable for one child, it’s framing is breaking down. The kitchen is fully stocked. The furniture and layout is family friendly. Nicely decorated. Quiet dead end road. The owners are super helpful, friendly and responsive! We will be back! We'd love to have you back again. Awesome Owner and Cabin management team!!! Beautiful and cozy cabin with a fully stocked kitchen. If there’s any issues all will be fixed or remedied within a respectable time. Town of Packwood never lets us down when we visit! Gave 4 of 5 stars because of the small issue I had, but all was taken care of. Highly recommend staying with this team. Incredible possibilities with this property could be so much more with few small updates. ate meals in and supplies were good. Sliding glass doors may have broken seals need to be replaced . Upstairs shower is tiny. Disappointed no direct TV signal dish seems to be blocked by large trees. Little things like a curved shower curtain rod,painted shelve in upstairs closet, bigger tv would be nice, new grill needed, some outside painting needed also This place is a diamond in the rough. But it serves its purpose close to town and park. Our sliding glass doors have already been replaced! Yay! They were faulty from the manufacturer and we were finally able to put in new ones. DirectTV has always been an issue being in the woods, surrounded by mountains. It's not the trees that are blocking anything, it's the DirectTV service that's not so great. Unfortunately, It's our only option in this mountain community. People are encouraged to bring their own grill. We supply a small charcoal BBQ grill, but do not vouch for it necessarily. Hopefully our cabin will not not perceived as a diamond in the rough. We have paid careful attention to detail, decor, style, amenities, supplies, etc. I do my best to provide the very best vacation cabin in the area. Very nice cabin, great kitchen, comfy beds, location very close to Mt. Rainier entrance!! A perfect home at the base of Mount Rainier!! Our family had a wonderful stay at this beautiful home!. The place was immaculate and the decor & attention to detail was great! We enjoyed cooking in the well stocked kitchen and enjoyed the hot tub after a day of hiking. The neighborhood was so very quiet. We would highly recommend renting this home! The house is very charming and well lighted. Lots of wood decoration, very beautiful. We have everything we needed during the two days we stay there. The community is very small and friendly, just few minutes to Mt. Rainer. Love it. Just 3 miles from Mount Rainier National Park and Paradise Inn entrance! Grove of Patriarchs nearby. Packwood Lake nearby. White Pass ski area just 13 miles away!